The M/V Fathom, a 35' x 13' asymmetric catamaran, recently arrived at Nimmo Bay Wilderness Resort in British Columbia, Canada. Boat builder Armstrong Marine partnered with Jutson Marine design to expand the resort's fleet in 2018. According to designer Scott Jutson, the new vessel is "unique in both function and style." Twin Yamaha 350hp outboards, paired with SeaStar Pro steering, power the high-performance catamaran, which recorded a 50mph top speed with a comfortable 35mph cruise. Built to Transport Canada standards, Fathom accommodates eight passengers and features shock-mitigating seats, shower, head, and interior heating. 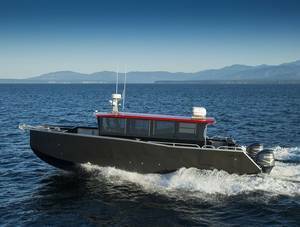 The walk-around/walk-through cabin, aft steering station, hydraulic drop bow door, spacious transom, and fish cleaning/bait station maximize usability and optimize wildlife viewing, beach landings, and loading/unloading. Craig Murray, Resort Founder, said, "The catamaran landing craft is just what we needed for the comfort of our guests as they experience the many wilderness activities in and around the Broughton Archipelago."